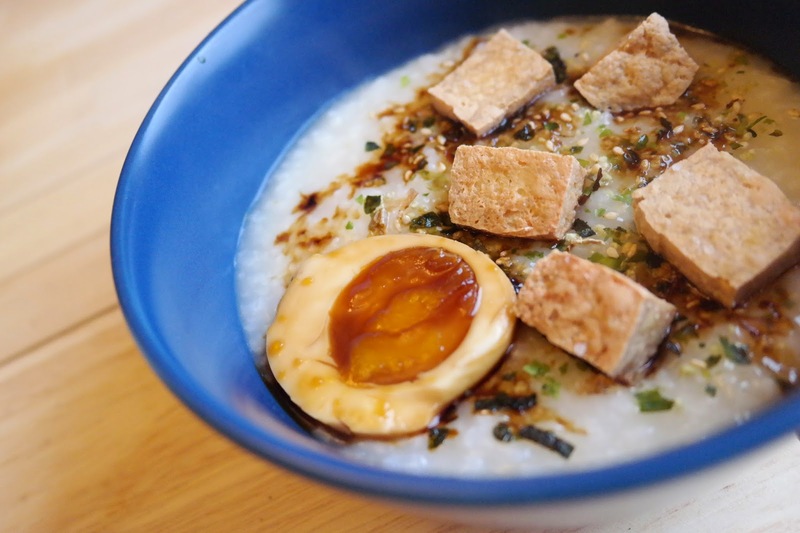 Congee: Stretching the Cheap into Super-Cheap! Rice is cheap. Cheap is what we’re about here. It’s also going to cool off in a few (several?) weeks, which is when I start cooking in earnest. Breads, soups, curries, casseroles; I’m an equal opportunity carbohydrate-pusher. Look how beautiful this dish is! And how nicely she photographs her lovely meal! I need a class or something. Or maybe new counters? It’s probably the counters throwing me off. Congee is a rice porridge. “Porridge? Isn’t that for children in Dickens’ novels and nursery rhymes?”–I can hear your skepticism even through the internet, Cheepsters. It is those things, but it’s also an excellent idea for you. It’s as simple as it gets, it’s cheap, and you’ll never have to run out to the store to get something to make it, because it’s all in your house already. Basically you cook rice with way more water than usual until the grains blur into each other. Yes, blur is the technical term we’ll be using here. You can use stock if you have some. You can start with cooked rice, and it’ll take a while. If you don’t have any cooked rice, start with uncooked rice, and it’ll take longer. Happily, it doesn’t need attention at this point as a polenta might–bring it to a boil, set it to low and let it simmer. I stir mine now and then and add more liquid if it needs some. When it’s pasty it’s done. That’s it. You made congee. Good for you! If you’re like my friend up there, you top it with marinated soft-boiled eggs (yum!) and fried tofu. Today, mine will get leftover chicken and vegetables. Tiny, who thinks everything should have ‘shaky cheese’ , puts parmesan on hers. 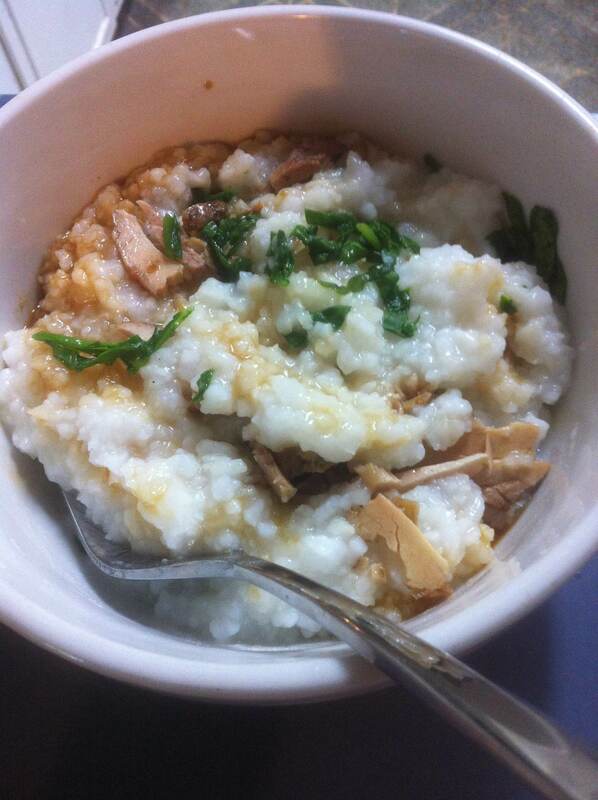 Congee is agreeable to whatever you want and have in the fridge. Pickled onions and pulled pork? Sure. Leftover stir-fy? Why not. The weird end of pot roast that nobody wants? Dice that up with a few garlic chives and call it lunch. 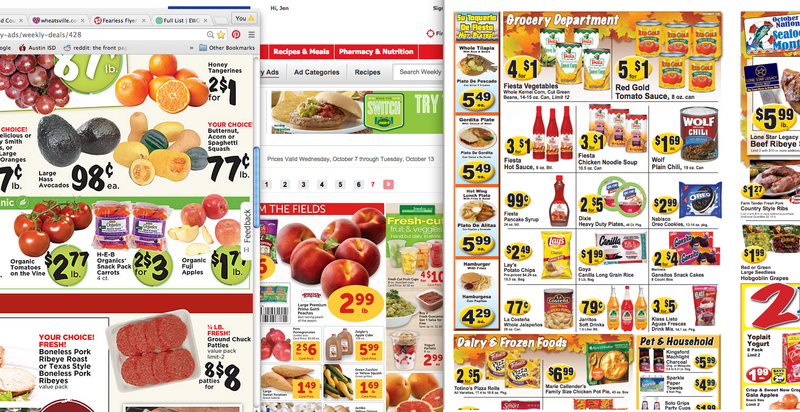 All the stores have gone Full Pumpkin this week, with all the ads having at least an entire column if not an entire page devoted to making sure you’ve got pumpkin options in every aisle. This is what I imagine TJ’s board meetings look like. 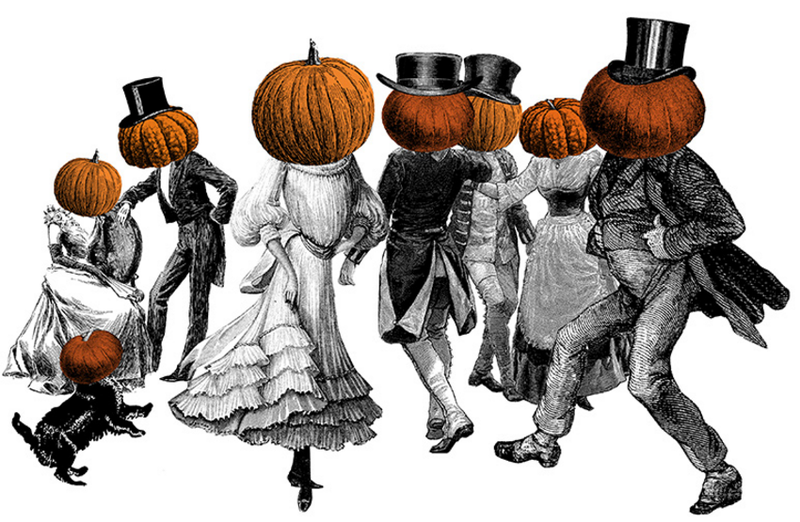 If you can keep it together and get past the pumpkin mayhem, there are some great buys this week. Pork loin is a staple at Chez Cheepie. I buy these when they get under $2/lb and portion each into three roasts. They’re really versatile: you can go savory or sweet, portion into chops, or cube for a curry. Other meats I’ll stock up on this week are ground pork and whole chickens. Apples of all kinds are on sale, I’ve listed a few varieties that are on sale in case you’ve got a favorite. Sprouts has avocados, carrots and tomatoes all at super-cheap prices. Head over there before the avocados all have thumbprint dents in them! Last, if you’ve got someone to cheer up, bribe, or woo, Sprouts has got roses on sale for just $5.99 per dozen! Is Friday night Pizza Night at your house? Oftentimes it is for us, but if I didn’t get the dough started in time it would turn into Refrigerator Buffet Night. The team is not such a fan of Refrigerator Buffet. Last week, while I was whining/moaning about not having gotten pizza dough started, some helpful friends pointed out that they use a recipe that mixes up in a few minutes, and is ready to roll out by the time they’ve gotten the other ingredients together and the oven preheated. It worked like a charm, saved me $30 on takeout, and we all really liked it. 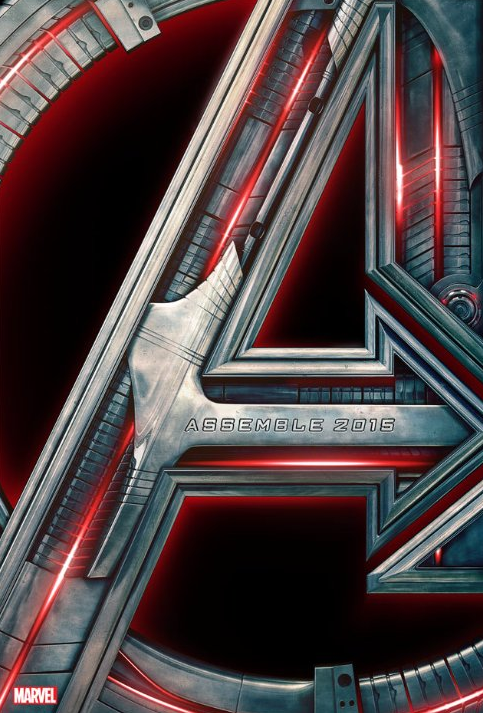 And I got to watch Avengers: Age of Ultron! Here’s the recipe, give it a try! Welcome to Wednesday! I wasn’t quite ready for it, so today’s post is more of a PM post than an AM post. If you found yourself frantically refreshing, wondering if I’d abandoned you, I’m sorry. See someone about that, though, because you might have a problem. Moving on! Central Market has moved from Italy on to some kind of cheddar mayhem. So if you’ve got $20 and want a pound of cheese, you know where to go. We have all kinds of apples on sale for less than $1/lb, and organics for under $2/lb, so if you were thinking of perfecting your apple pie recipe now’s the time. Also, invite me over. Double also, what are you thinking? It’s 95 degrees out. Don’t turn the oven on! Bake in November when it’s only 85. This week three places have organic potatoes on sale, which normally I don’t even see in one flyer, so if you’re an organic potato shopper this is your week! 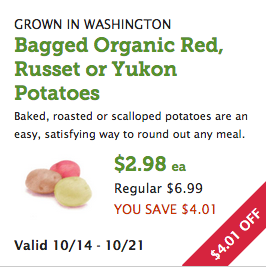 Russets, Red and Yukon Golds are all on sale. Pork chops, grapes, cantaloupes and cheese are all on loss-leader prices this week, so stock up! possibly organic potatoes in sacks, but since all I’ve got is this to go on it’s hard to know, since ‘sack’ isn’t a standard unit. It certainly looks like a deal, with the saving of $4.01 and all, but you’ll have to let me know if you visit WF. That’s it for this week. Signing off. Cheep Cheep! I might have a small dish disorder. This weekend I saw a 12 place china setting that would be perfect for December because of the lovely green-vined red-berried pattern on the rim, and nearly bought it despite already owning more dishes than your average bear. It was just so tantalizing! Curvy rims that were also pointy. 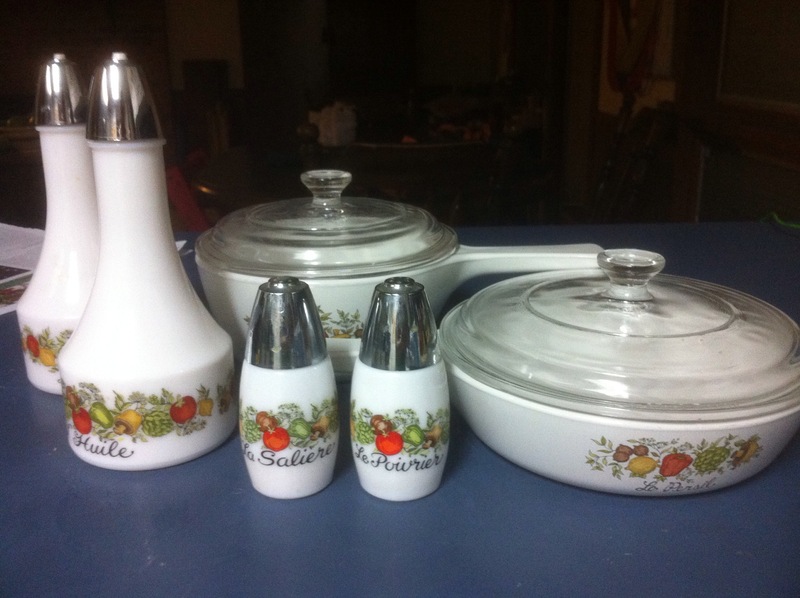 All the fun stuff was there too-not just a creamer and sugar bowl, but even a pitcher! Look how cute! And at$2-3 each it’s the kind of collection my budget can stand. If you’ve got a collection you love post a pic–I’d love to see! It’s a sort of slow week. 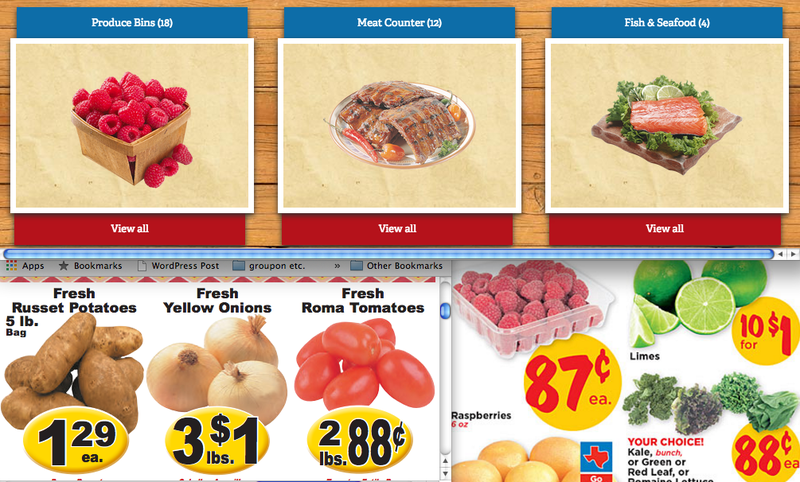 Apples, grapes, boneless skinless chicken breasts (bscb), all for cheap. Asparagus is a surprise, normally only up for cheap in the spring. Fiesta is having a great weekend sale, so check it out if you’re anywhere on I35 this weekend. Also, today is the last day for the 98c raspberries at Sprouts. Cheap berries are about to be gone until spring, so this is the last gasp. They freeze well, so buy what you think you’ll use!